We carry 47 of the Designers Gouache in 14 ml tubes. In the 37 ml tubes we carry 4 colors. If you would like a color we do not stock we can order it for you. We receive Winsor Newton paints twice a week. Some colors made from soluble dyes may bleed through a superimposed color. Gouache colors are a range of opaque watercolors, so called because they were developed for and continue to be mainly used by designers. 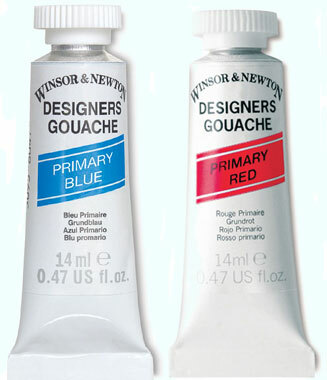 Gouache is however also used by fine artists as an opaque watercolor, or in combination with watercolors. Click on the color chart to enlarge.